November 18, 2014. Washington, DC–. At the recent Solidarity Movement for a New Ethiopia (SMNE) Forum in Washington D.C. on November 15, it was quite evident that Ethiopia does not lack for gifted people who possess the essential capabilities, virtue, and experience needed to build a New Ethiopia. It was inspiring to hear from a wide array of speakers who portrayed the qualities of courage, strength, faith, wisdom, integrity, and an attitude of respect towards others, even when some differences of opinion emerged. This was a civil dialogue, meant to be a model for how Ethiopians with grievances against each other or simply of diverse backgrounds might come together to forge a better future. People came together as people first. Then, they came together around shared values—a desire to see a society where truth, freedom, justice, civility, opportunity, and harmony could prevail for all its people. Discussions both within the forum and outside the formal discussions were lively as people, most of whom had never met, shared opinions, ideas, and stories. New connections were made. The forum, Breaking the Cycle of Dysfunction in Ethiopians Institutions, was unique in that it focused on providing a structured venue where Ethiopians could talk to each other rather than about each other. It was broken into two sessions. The first session focused on: Dysfunctional Institutions in Ethiopia. SMNE board member, Ato Negash Abdurhman moderated the discussion following a welcome by SMNE Executive Director, Obang Metho. Speakers included professional experts and former EPRDF public officials who attempted to fulfill their duties within the present system in Ethiopia and found themselves either a target of the TPLF/EPRDF, like Soleyana Shimeles, a founding member of Zone9, and/or in an inner conflict with their own consciences and values, like in the cases of Fayisa Israel Itansa, a former Supreme Court Judge in the Oromia Regional State, or like Ermias Legesse, the former Ethiopian Deputy Minister of Communications for the EPRDF. Dr. Fekadu Bekele, who joined in by Skype from Germany, served as an example of one of those Ethiopians with great expertise who has been unable to contribute to the country for many years due to the state of affairs in Ethiopia. In all cases, had these highly qualified individuals been able to contribute their talents within Ethiopia, we Ethiopians would benefit. The same goes for theafternoon speakers, who mostly focused on their stories, ideas and solutions for the deteriorating situation among our people in our motherland. The second session was entitled: Identifying, Affirming and Building a New Ethiopia based on our Shared Core Values. The afternoon part of the forum was entirely in Amharic, rather than in English as was the case in the morning session. The speakersincluded: Reverend Tegga Lendado, Fiorella Romano, Fayisa Israel Itansa, Sheik Khalid Omer, Akalu Tirfie, Sewasew Johannessen, Negasi Beyene, Dibaba Amele, Yohannes Berhe , Hamrawit Tesfa and Bishop Memhere Fere Senbete. The session was opened by SMNE board member, Dawit Agonafer and moderated by SMNE Executive Director, Obang Metho. Opening prayers were given by Sheik Khalid Omer and Sewasew Johannessen; closing prayers were given by Bishop Membhere Fere Senbete. Listening to these amazing Ethiopians speak was very uplifting and proved to be a real highlight. As often is the case, the focus was not simply to point fingers at the current TPLF/EPRDF regime, but to better understand how we must rethink our cultural views as some of them are detrimental to our own well being or the well being of our fellow Ethiopians. How can we be more virtuous? How can we mend wounds between our people? How can we restore justice and truth? How can we first look at ourselves before accusing others? How can people of various religious backgrounds act as mobilizers of love, respect, truth, accountability and justice as expressions of faith in a God who seeks a reconciled relationship; not only with oneself, but with our neighbors? As some presenters stated, they were not there as members of any opposition party; but instead as people who sought to break down the barriers by talking to each other. The meeting was a success because speakers came from all over the world and spoke to others from their hearts, beginning a much-needed process of healing, the first step, leading to people-to-people reconciliation. This was the objective of the meeting. “This is not a political event, but an effort to start a dialogue among people who care deeply about Ethiopia. That is why we believe you should be part of this discussion. It is not about being “pro-government” or “anti-government” but about being “pro-future” for the common good of Ethiopians. All attendees should expect differences of opinion among the people; however, this forum is to serve as an example of the best of Ethiopian civility so all, including you and your staff, feel safe to participate. This is something we will make clear from the start, that all persons, regardless of whether or not they agree, would be expected to offer unconditional respect and courtesy, furthering an atmosphere where we can learn to respect each other. This is a core principle of the SMNE and foundational to building a new Ethiopia. Such an Ethiopia would have room for all of us.” See here the link for Full letter. The meeting was streamed live and many who were unable to attend took advantage of this opportunity to participate from wherever they were located. 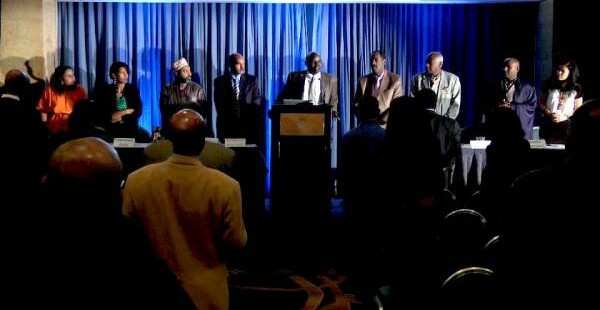 Voice of America (VOA), find the attachment for the audio of VOA’s report or click the link here to listen to the report and ESAT filmed the event. Please click the following link here to watch it on ESAT. We are grateful for that support from VOA, ESAT and other websites and radios. The SMNE also had someone videotape the entire event, including a pre-eventdinner where speakers shared their stories. It was not only interesting andinformative, but also emotionally touching in many cases. We all have our own stories to tell and our own contributions to make. What a difference it would make to begin to do the same wherever we are so that what happened at this forum—talking to each other rather than about each other—could be duplicated many times over, wherever Ethiopians are found—at coffee shops, your church or mosque, your community center or even at your own dining table. There is a need to talk about the problems between us. At this point, this is not reconciliation with the government, neither is it reconciliation between various opposition groups; but instead, it is with each other so as to work together for the common good. What will make it productive is when we are able to show respect and care for each other as we work through difficult issues. We may need to identify and stop using emotionally- charged language that gets in the way of hearing each other. On the other hand, we may also need to overlook some of what offends us and not personalize it in order to achieve goals that are bigger and better. Once we get to a point where trust is built, we can start to work as a team to bring lasting change to Ethiopia. We then can more easily find ways to solve our problems, grievances, inequities and shared challenges. It requires becoming a culture of peacemakers. It includes speaking the truth in humility, seeking justice and respect for our neighbors and becoming people of virtue who uphold the law in our hearts. It is our God-given responsibility to break down the walls between ethnic groups, religious groups, political groups and other factions, becoming the peacemakers; yet, not compromising our core values. What we learned this weekend is that it is actually possible to do because these people did it. Now we must build on what they accomplished so people in many places can become part of it. The SMNE hopes to organize another forum in Europe in the spring of 2015. May God give us humble hearts, ready to listen and slow to take offense, ready to ask forgiveness and to give forgiveness. May God guide us as we seek to build a society where we uphold the humanity and value of all our people for none of us will be free until we all are free.